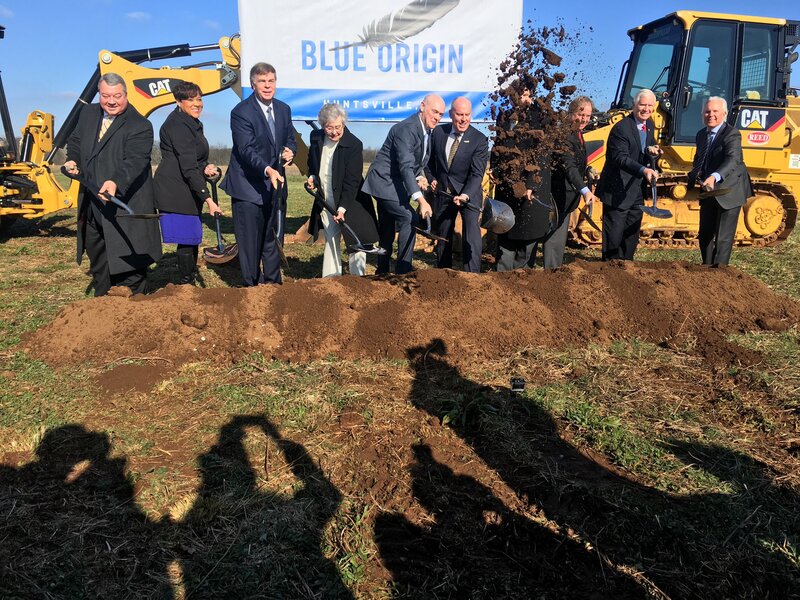 Civic leaders and space executives tossed shovels of dirt today to celebrate the groundbreaking for a $200 million rocket engine factory to be built in Alabama by Blue Origin, the space venture founded by Amazon billionaire Jeff Bezos. “It’s a great day here in Rocket City, and it will be that way for years to come,” Blue Origin CEO Bob Smith declared during the ceremony at Cummings Research Park in Huntsville, Ala. The 200,000-square-foot facility is to open in March 2020 and manufacture BE-4 rocket engines for Blue Origin’s orbital-class New Glenn rocket as well as for United Launch Alliance’s next-generation, semi-reusable Vulcan rocket. ULA’s rocket production facility is located nearby in Decatur, Ala. This entry was posted in GeekWire and tagged BE-4 Engine, Blue Origin, New Glenn, Propulsion, Space. Bookmark the permalink.